How to Look and Feel Great in 2017! Daddy Daughter Makeover or Mother Son Fun Valentine's Packages! Get a Daddy Daughter Makeover or Mother Son Fun Valentines Package for only $29.95 (at participating locations)! The Daddy Daughter Makeover includes one Diva Day and a FREE certificate with 4x6 photo. There's also an option of adding a haircut for Dad for a total of $39.95. Meanwhile, our Mother Son Fun Package includes a boy's haircut with stripes (Mom gets matching stripes in her hair) and a special keepsake photo! Hurry, spots are filling up fast - especially since this amazing offer ends February 28th! Yay! It's the Amazing Semi-Annual Bow-Out Sale! Our amazing bow wall is really a fun sight that you don't want to miss! Our collection of hairbows come in all shapes, sizes and colors, and right now many of them are on sale (at participating locations)! In fact, we have so many hair bows and accessories to choose from, that it's sure to be an experience you'll want to come back for again and again! And best of all, right now all of our beautiful Christmas Bows are on Clearance! Check it out! Great Savings for the New Year! Are you ready to feel great in 2017 with some special sales from your favorite kids hair salon and toy boutique? If so, check out our coupons for the month of January (at participating locations)! For example, how does 25% off a single full priced retail item valued at $10 or more sound? Find these special coupons and many other great deals over on our coupon page! Albuquerque Best of the City for the 3rd Time in a Row! Albuquerque The Magazine readers once again voted the Albuquerque Shear Madness Haircuts for Kids location as The Best Place for Kids Haircuts for 2017! If you recall, our Albuquerque Shear Madness also won Best of the City in 2014 and 2015 too - and that's super awesome! Congratulations to owner Michelle Vick and her great staff! 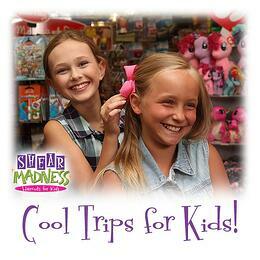 Click here to visit the web site for the Albuquerque Shear Madness Haircuts for Kids. Shear Madness Opening in Humble, Texas This Week! It's always such exciting news when a new Shear Madness Haircuts for Kids store is opened - and we're super happy to announce that our location in Humble, Texas will be opening this week! If you have friends in the Houston area, please share this with them! If you'd like more details on our Humble, Texas Shear Madness Haircuts for Kids, please click our Humble location page! Don't Get Left Out in the Cold! With all the exciting stuff coming up in 2017, make sure you're also in the know with everything that's going on at Shear Madness! Be sure to regularly check in on the fun going on at our Facebook page, Franchise Blog, Instagram, Google+ and Twitter! And don't forget - you’ll want to take a look at some of our favorite Shear Madness pins this month on Pinterest! Join the Fun! Open a Shear Madness in 2017! 2016 was another great year of growth for Shear Madness Haircuts for Kids, which means that there's no better time than NOW for you to discover more about how to own a franchise! Get all the details on what it takes to open an exciting Shear Madness location in your city by checking out our franchise website and blog (where we have numerous articles and free downloads). And who knows...maybe one of these days you'll even be the proud owner of your own Shear Madness Haircuts for Kids! Get Crafty in 2017! It's cold outside for a lot of our readers, so why not make something fun with your kids indoors with our great Crafts for Kids section on Pinterest! Learn not only how to make a snowflake stained glass window (as seen at left), but also find details on making a winter craft tree, snowman snack cups, snowtime bingo, sparkly icicles, foam cup snowmen, paper polar bears, popsickle snowflakes and downloads for fun winter color sheets! From all of your friends at Shear Madness Haircuts for Kids, we wish you a very happy New Year! 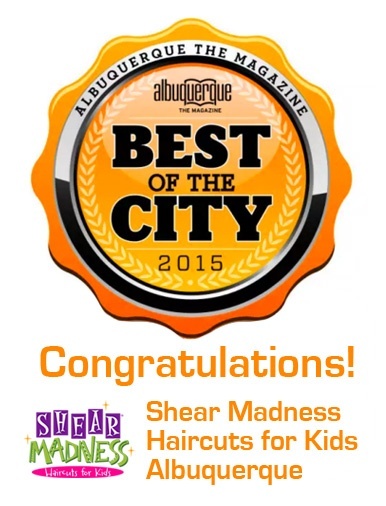 Albuquerque Shear Madness voted Best of City 2015! 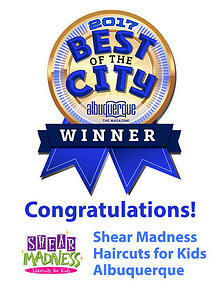 Some of our readers may recall that the Shear Madness Haircuts for Kids Salon Franchise in Albuquerque was voted Best of the City in 2014 (which you can read about here). We are excited to say that they've done it again, and have been voted by readers as Albuquerque The Magazine's Best of the City for 2015! This is quite an honor to be sure, as over 100,000 votes were cast in order to spotlight those businesses, organizations, restaurants, and people that help make Albuquerque such a great place to live! Listed under the "Best Kids' Haircut" Category, Shear Madness Haircuts for Kids is noted by the magazine as not being just another kids' salon, but as a unique place where "every child matters". The article goes on to explain how, "to help fend off boredom and apprehension many kids fear at the salon, Shear Madness Haircuts for Kids has mounted cars for styling chairs, televisions and Xbox games at every station to make the experience fun and special." Additionally, Shear Madness also has an award-winning YOUniquey Boutiquey where kids and parents can shop a fantastic selection of toys, jewelry, hair products, hair accessories and more. And to top it off, by mixing in ShEAR Dazzled Ear Piercing (a unique ear piercing experience), the La De Da Spa, themed parties, and a great styling staff - customers are sure to find something to bring a smile to their face! Michelle Vick, owner of the Shear Madness Haircuts for Kids in Albuquerque states that some of the reasons her store has been selected two years in a row for the Best of the City honor is because the store is a "unique, fun and happy place." She also notes that, "We really work at great customer service and creating an awesome experience for parents and children alike, and I'm proud of how hard my stylists work at building up personal relationships with their customers. I'm also really thankful for how loyal our customers are!" Michelle also notes the important part that effective marketing plays in being recognized by parents and children as an outstanding kids salon. By generating positive brand awareness, the salon has seen steady growth since opening only two years ago. 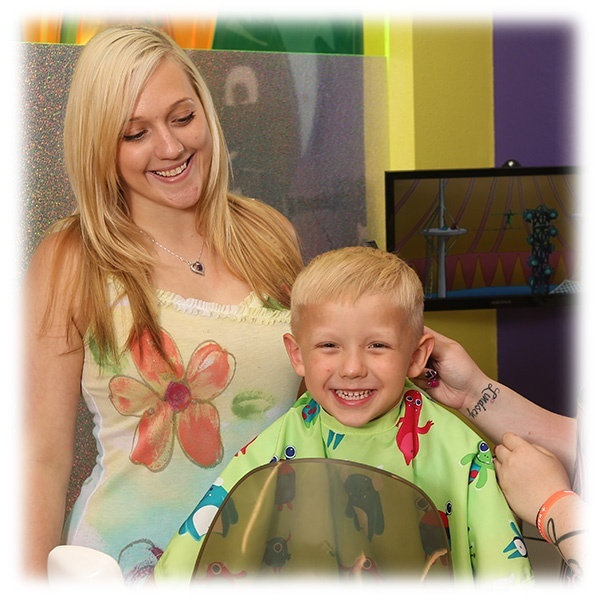 Additionally, Shear Madness Haircuts for Kids in Albuquerque has really perfected the art of not only giving a great haircut, but also hosting fabulous kids Birthday parties! For example, the spa party concept has been a real hit in Albuquerque. Girls are treated to wearing spa robes, getting mini manis, twisty updos, glittery makeup, and a glitter tattoo. They sing Karaoke and get to choose a headband from the YOUniquey boutiquey to take home!